In June, the city of Fairlawn and the Medina County Fiber Network in Ohio recently announced that they would soon begin working together, which will expand FairlawnGig, the city's municipal network. The collaboration will boost connectivity in the region for residents and provide more options for businesses in Akron and surrounding communities. Deputy Director of Public Service Ernie Staten told us that when city leaders commenced the FairlawnGig project, they promised the community that they would first build out the the entire community of 7,500 residents. They achieved their goal in May and now have a 47 percent take rate in the city. The strong numbers indicate Fairlawn’s intense need for better services than incumbents were providing. Staten told us that, in completing the deployment in Fairlawn, the city’s infrastructure now has a solid north-south presence. By leasing capacity on the Medina County Fiber Network (MCFN), FairlawnGig can expand in an east-west direction. Potential commercial subscribers in Akron, east of Fairlawn, have already reached out to FairlawnGig offices, seeking more information. Staten notes that, while businesses in Akron have had access to connectivity from incumbents Spectrum and AT&T, prices are high and services are limited. FairlawnGig via the MCFN will be able to offer more options. Businesses will have access to services such as dark fiber connections, cloud services, data transport, and connections of up to 100 gigabits per second. Staten also believes that local businesses want the personal service and accountability that comes with a local provider. Staten says that residents who live in the more rural areas west of town have also contacted FairlawnGig to find out more. FairlawnGig Fiber-to-the-Home (FTTH) gigabit service costs $75 per month or residents can opt for a 300 Megabits per second (Mbps) connection at $55 per month. Ten gigabit service for residential premises is also available and all connections are symmetrical. Voice services are also available; residents can sign up for $25 per month and receive two lines. FairlawnGig doesn’t offer video service, but makes resources available to help subscribers learn how to cut the cord to access video content. "Every day we're approached by organizations as well as households in the region asking to bring our world-class service to their communities. Until now we've been focused on Fairlawn but are pleased that just eighteen months after we started serving Fairlawn in the winter of 2017, we're able to expand to surrounding communities." We first reported on Fairlawn in 2015 when they had planned on pursuing a public-private partnership. By 2016, however, they had decided to approach the project as they would any other necessary infrastructure project and go with a publicly owned and operated model. When we talked to Staten for episode 201 of the Community Broadband Bits podcast, he described how they would use revenue bonds to fund the fiber optic and Wi-Fi network. By late 2016, they were already connecting businesses in Fairlawn and residents had access just a few months later. Earlier this year, Staten came back on the podcast to update us and reported that the network was attracting new businesses and boosting property values. Staten feels that the agreement between both publicly owned networks is a way for both to further their credibility while promoting better connectivity in the region. For FairlawnGig, the collaboration allows them to transition from municipal to regional ISP. MCFN will have more of a presence in the residential market once FairlawnGig is serving households along its path. MCFN has been serving the region for about six years. The dark fiber was a project of the Medina County Port Authority and first connected Highland Schools in 2012. The school district's contract with Time Warner Cable (now Spectrum) was about to expire and, rather than enter into another overpriced agreement that didn’t provide the kind of connectivity they needed, the MCFN revised their construction schedule so the schools could connect sooner. As a result, the school system has saved about $90,000 per year. Since then, the network has boosted local economic development, reduced the cost of connectivity for public facilities, and provided infrastructure on which numerous ISPs have chosen to offer services. Corrado told us that FairlawnGig is the thirteenth carrier to connect to Medina County’s open access network. 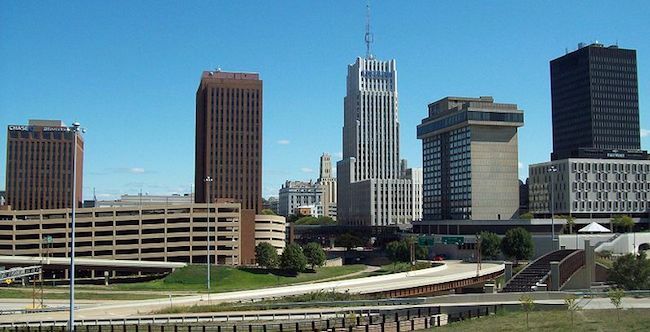 Image of downtown Akron by Sleepydre [Public domain], from Wikimedia Commons.